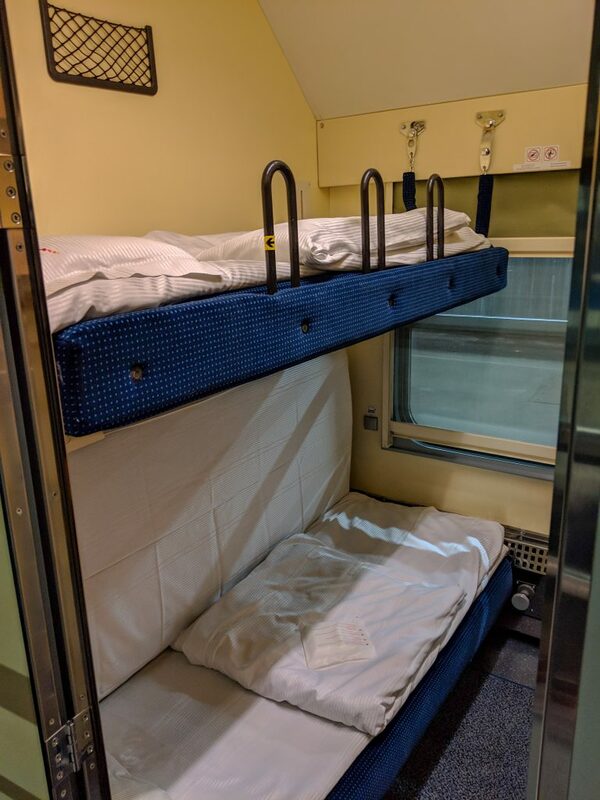 The overnight train from Budapest, Hungary to Warsaw, Poland was a great way for us to travel comfortably and save money on a hotel room. We’d highly recommend it! Here’s our detailed experience so you can know what to expect. 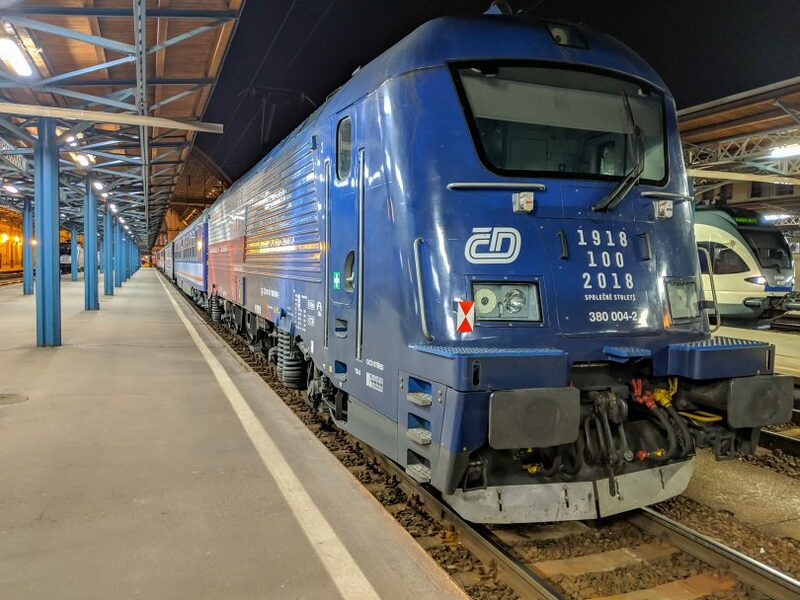 The Budapest to Warsaw train is operated by PKP Intercity. You cannot buy tickets online directly. You can purchase them in-person, but risk the tickets being sold out during busier months. Your other option is to use a third party booking system. We used Polrail, as suggested by Seat 61, and would highly recommend them. After purchasing our train tickets online, they arrived by mail in the US in less than a week. You can also pick up the tickets in person (in major cities in Poland, though, which isn’t possible if you’re starting out in Budapest) or have them shipped to your hotel. 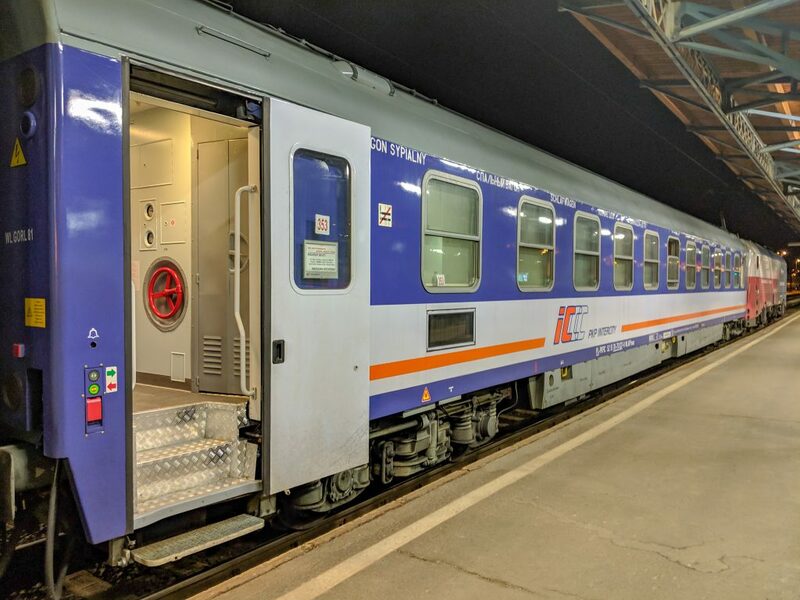 The Budapest to Warsaw overnight train takes 14 hours. 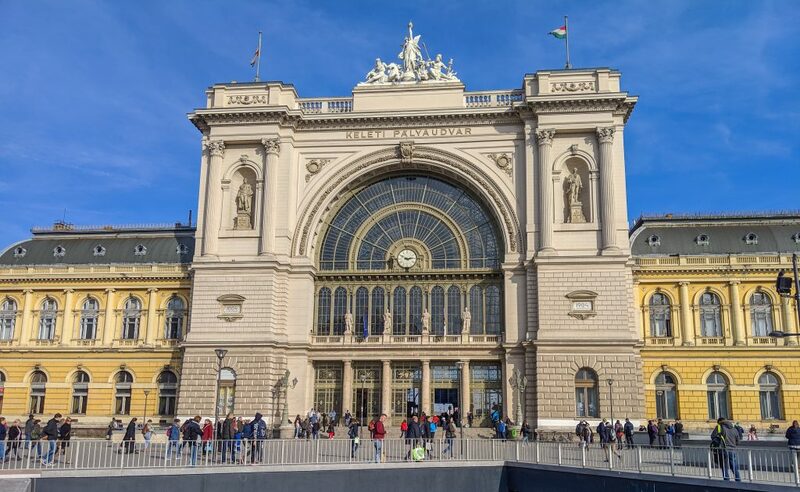 It departs from the Budapest Keleti station and makes its way north into Bratislava, Slovakia, pops over into the Czech Republic and then continues to Warsaw, Poland through Krakow. 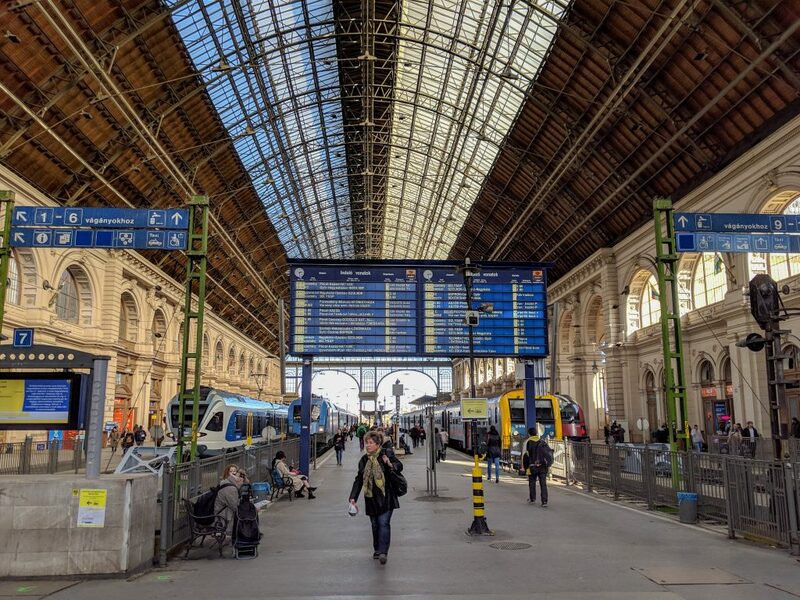 The interior of the Budapest Keleti station is beautiful and simple! Note: There are more platforms near the other end of the station and we saw several people who didn’t realize they needed to walk a bit to find their trains. We opted for second class tickets which cost $188 total for two people. This included a private compartment, two bunk beds, and a sink. 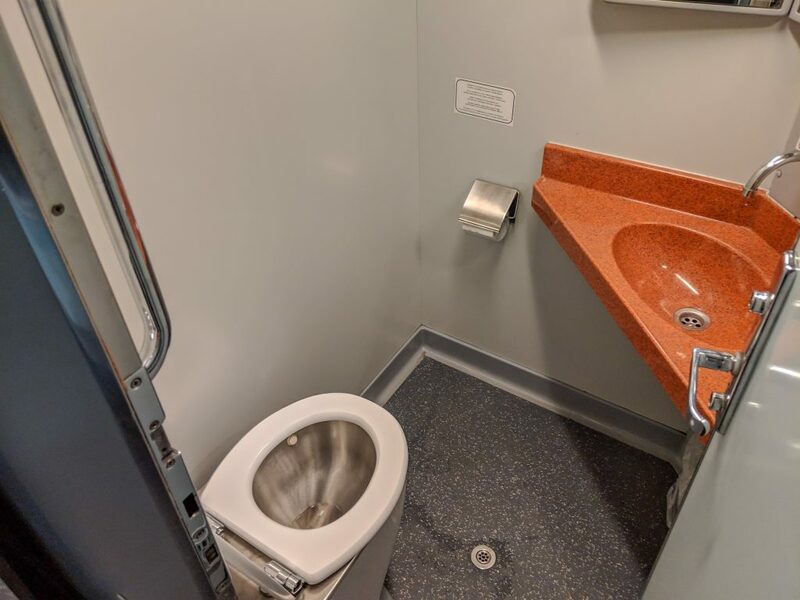 There is apparently a first class option which includes a private in-room bathroom and shower, but we did not see this option when booking and don’t think it would be needed. Finding your train is simple. Watch for your train’s departure time to show up and watch for the platform number. Google Translate is useful if you aren’t sure what the Hungarian comments mean. Once you have found your train, find the number of the car, which will be on your ticket. We were in car 353, which happened to be at the front of the train. The car numbers don’t go in order, so you have to check each one as you walk by! The private rooms are small, as on all trains, but perfectly adequate. The bunk beds had already been turned down and were ready for us to climb in. There was a small counter space which lifted up to reveal the sink. 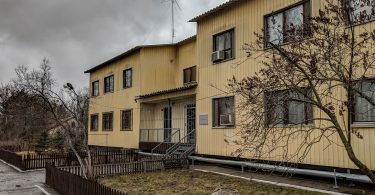 Above it, there was a cupboard with four bottles of water, some chocolate muffins, and two hygiene kits with a disposable washcloth and bar of soap. Below the sink was a small trash can. The narrow hallway. 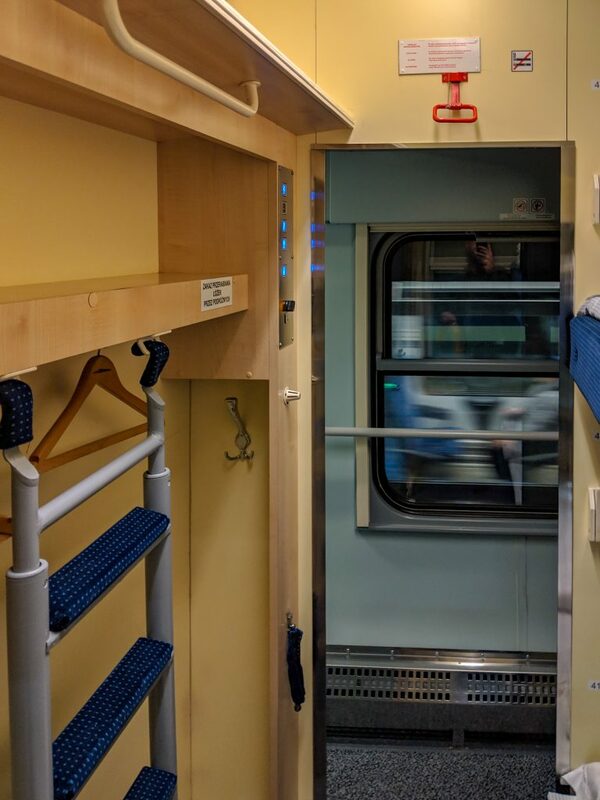 Bathrooms are on either end of the car, and compartments line the corridor. The first room on the right is where the attendant spends the journey, and where you can purchase drinks and snacks. There was a large window that could be opened about halfway. There are also curtains and a shade that can be drawn. You will be passing through other train stations and lamp posts through the night, so the window shade is really useful! Our sleeper compartment was already made up for us when we arrived. To the right is a small sink and mirror. Looking out towards the corridor from our window. There is some space to hang bags and the ladder to the top bunk folds away for more space to move around. Below the window was a radiant heater. This might not be needed in the summertime, but in the colder months it was very helpful. The door to the compartment locks, and we should make note of this: When you are tucking in for the night, it’s imperative to lock the door, and always keep your valuables secured! There are stories of thefts on trains, even right under the nose of occupants who are sleeping soundly. There is no dining car on this train, so we would recommend eating prior to leaving and packing food. There were some snacks, water bottles, and juice on display and available for purchase from the train attendant. There were two wash closets on either end of our car. They are a tiny bit more spacious than your average airplane lavatory and consist of a toilet and sink. Clean enough, but don’t go in here barefoot! 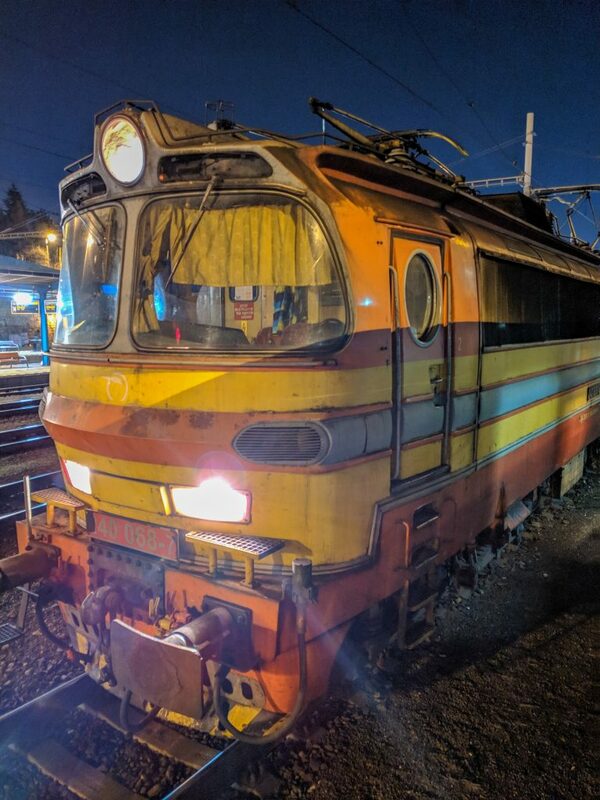 As with most overnight trains, we made several stops through the night. 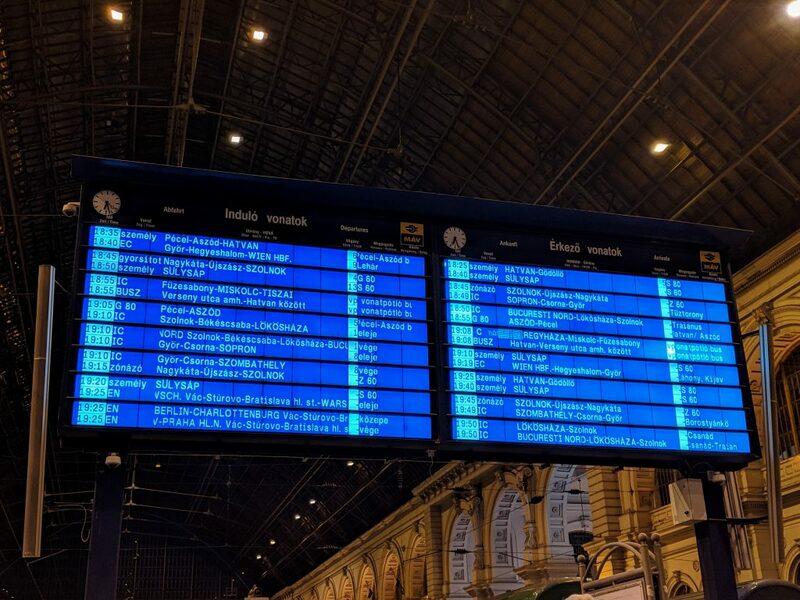 We disconnected cars that were bound for other destinations and picked others up that did not begin in Budapest. It was difficult to get the temperature of the room right. We were traveling in March, so we had the heater on. While the heater wasn’t very warm to touch, it did get a bit stuffy during the night. We ended up keeping the window slightly cracked to even things out. If you happen to be awake at some of the remote stations, you might be lucky enough to see one of these old relics! In the morning, about an hour after sunrise, our train attendant knocked on our door with two cups of coffee, some powdered creamer and sugar. A nice touch for a no-frills overnight train trip. We were keeping great time through the Polish countryside. I’m sure on a typical journey we would have arrived as scheduled. However, our train had a slight problem. When we were halfway between Kraków and Warsaw the train put on the brakes a bit harder than we had felt previously. We came to stop in the middle of nowhere. Some train workers got off and were looking under the train car behind ours. They spent about 25 minutes inspecting and chain smoking before they got back on the train and we started slowly making our way down the track. We made it to the very small Opoczno Poludniowe train station, outside Swiercyna. More workers began congregating around the train car, more time passed, more men smoked cigarettes, and workers and security officers began hanging out in our car. When I asked one of them what was going on, all I got from him was, “car is broke”. 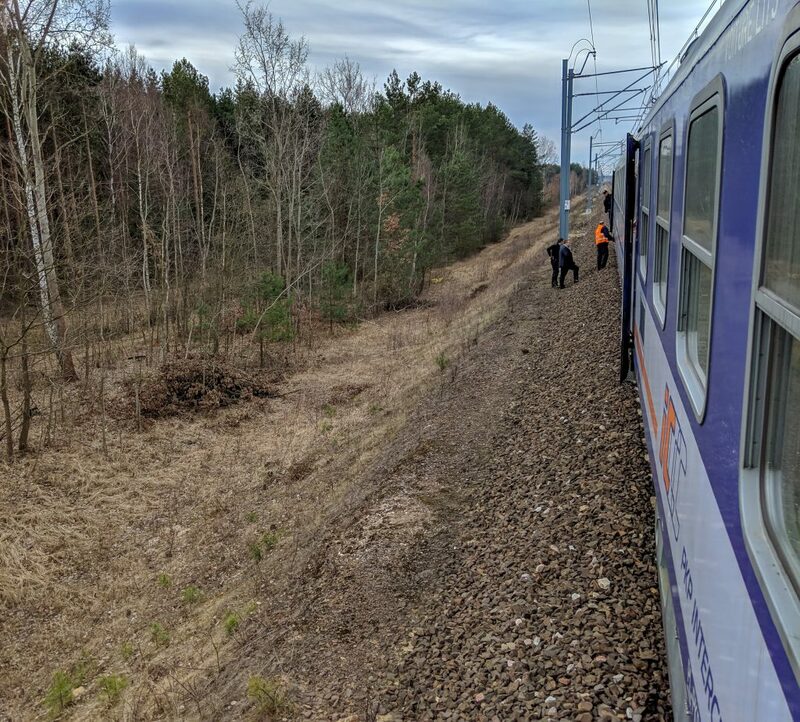 We still aren’t sure what that meant, but we ended up leaving that car on the tracks after we assume they moved those passengers to other cars. We continued the last leg of the train journey into Warsaw at a normal pace. About 20 minutes from arrival, our train attendant popped into our compartment and wordlessly handed us a sweet snack- we assume because of the delay. 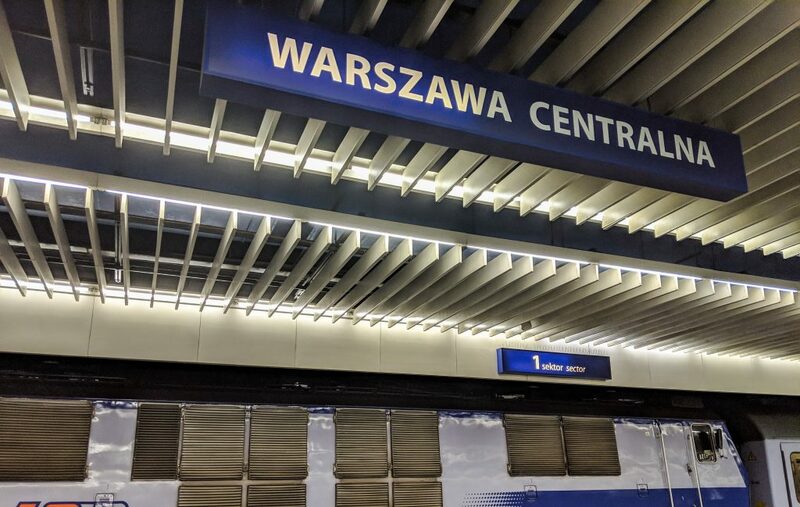 We were about an hour late arriving into Warsawa Centralna, which for us was fine. 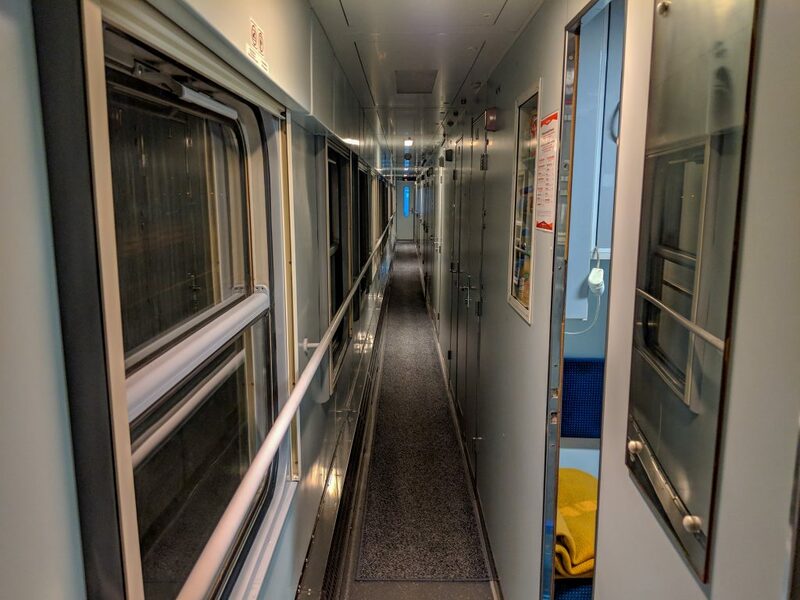 Overall, we were very happy with our experience on the overnight train from Budapest to Warsaw. 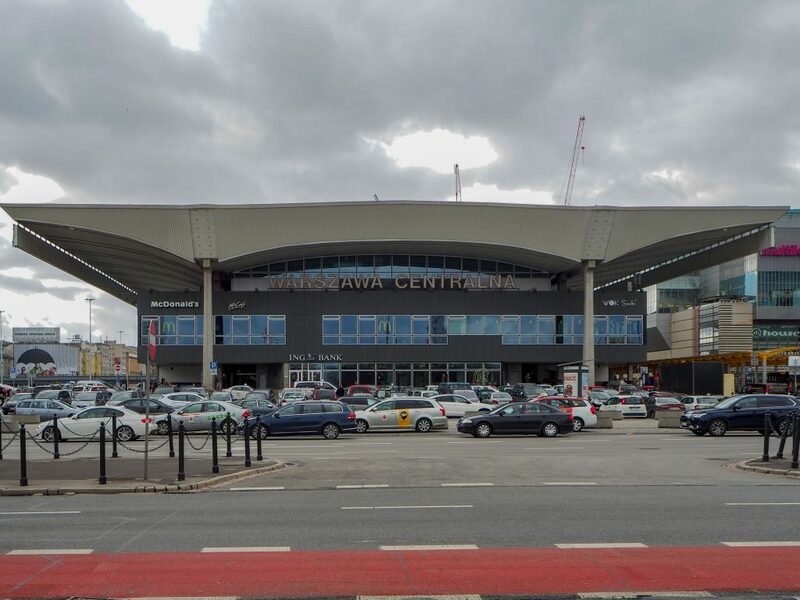 It saved us from paying for a hotel and a stressful airport experience. 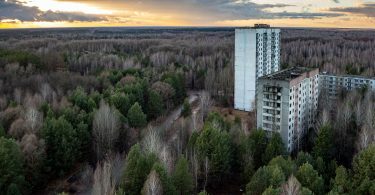 We got to see parts of the countryside we would never have witnessed otherwise. If your travels take you from these two cities, we would absolutely recommend taking the overnight train.